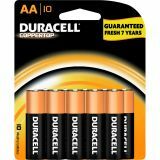 Duracell Coppertop Alkaline AA Battery - MN1500 - Long-life alkaline AA batteries operate reliably in temperature extremes of negative 20 degrees Celsius to 54 degrees Celsius. Recommended for use in smoke alarms, flashlights, lanterns, calculators, pagers, cameras, recorders, radios, meters, scanners, CD players, medical equipment, toys and electronic games. Batteries are long-lasting and dependable after 10 years of storage. Include freshness dating" on each package and battery."